Museum of the City of New York - Street Scenes - 1900, Sixth Ave. Near 18th St.
Street Scenes - 1900, Sixth Ave. Near 18th St. The 6th Avenue entrance to Siegel Cooper Co. dry goods store at 18th Street. 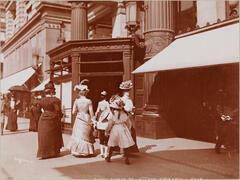 Well-dressed female pedestrians with elaborate hats are strolling past on 6th Avenue.